Poly-Texx® 350LX, 350LXC and 350 LXS comprise a family of UHMW based materials that are not only abrasive resistant, and FDA compliant, they boast the lowest coefficient of friction of any UHMW based product in the industry. 350LX is designed for standard bearing and wear applications against cold rolled steel and stainless steel mating surfaces, and the standard color is blue. 350LXC is specifically designed to run against POM (Acetal) conveyor chains and is gray in color. 350LXS is an anti-static grade that is black. 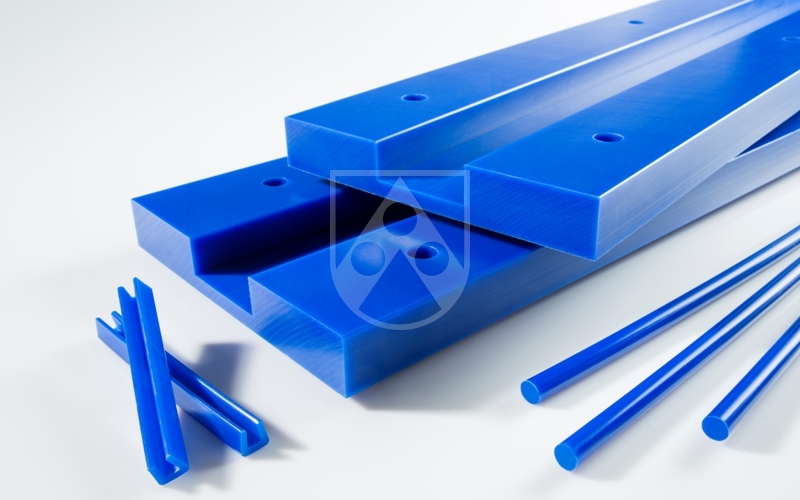 All are available in standard sheet and rod sizes, as well as custom profile shapes. Typical applications are in the food and beverage handling industry for chain conveyor guides. Sleeve and flanged bearings for industrial and manufacturing bearing applications are also common. All three can be machined to custom components according to client specifications. Its main attributes are low coefficient of friction, excellent impact strength and abrasion resistance. Its self-lubrication properties and excellent mechanical properties makes Poly-Texx® 350LX a great choice for many demanding bearing and wear applications. Maximum Limiting PV (Unlubricated) PTM 55007 2,500 psi x ft/min. Embrittlement Temperature -180 °F Min. Continuous Service Temperature in Air 180 °F Max. Short Term Service Temperature 220 °F Max.